Shalom, chaverim! 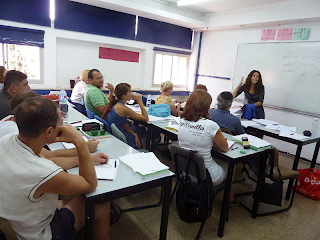 We're in the thick of it now--only three more Ulpan class days before the final written exam next Wednesday. We took a practice test in class on Thursday, but instead of freaking out about the test itself, we nearly had a class mutiny over the air conditioner. Half of the class was too cold with the air conditioner on, so some students covered the vents with a large poster board. 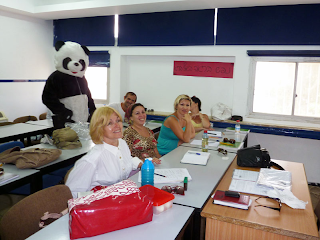 The other half of the class then nearly passed out from the heat, and found it extremely difficult to concentrate. We ended up switching places during the break: the "hotties" moved to the back of the class to be closer to the vents, and the "coldies" moved to the front of the class, away from the draft. Then we had trouble with several students talking and disrupting the class, and our teacher had to threaten to expel them from the room. Drama! Clearly, the stress is beginning to take its toll. For almost everyone in the class, this is our first summer in Israel and many are having difficulty adjusting to the heat and humidity. Three of our classmates are also having "Ulpan babies," in that they became pregnant after Ulpan started, so it must be even worse to be "sweating for two." I must say, though, we were all repeatedly warned by everyone about Nahariya summers. Yes, it really does get very hot and sticky, and it's probably going to keep getting hotter until the end of August. These students are learning English, but the classroom layout looks exactly like ours. Except that we are seated from right to left. Thanks to www.efl-esl.com for image. The heat has not been much of a problem for Elul and me, fortunately, since we had a good year's worth of practice by living in Boca Raton, Florida, before we made Aliyah. However, after spending each morning slogging away in Ulpan, by the time we get home in the afternoon we are soaked through with sweat and need to lie down in a dark room in order to recover. We then emerge hours later, when the heat of the day has begun to wane. Now that I'm living through it, I really appreciate the sensible practice of having a siesta. Even the street cats are nowhere to be seen during these hot hours. Our thoughts are beginning to turn to "what do we do next?" We're not sure. We need to get our university diplomas recognized by the State of Israel, and we need to sign on with the unemployment agency the minute Ulpan is over. We need to create resumes in Hebrew, and I certainly need to get some professional advice about how to explain various gaps and abrupt career shifts in my job history. It's daunting, because even though our oral exams went very well, and our written practice tests also are getting good marks, we know we're not able to converse fluently yet. Likewise, we don't have a car, which will either limit us to local employment opportunities or will necessitate a long commute. Finally, Elul's profession (television news anchorman and independent videographer) is not exactly in high demand in a town with no local television station and where the vast majority of the viewers are fluent only in Hebrew or Russian. However, to paraphrase the great David Ben-Gurion, you cannot be a realist in Israel and not believe in miracles. Miracles can and do happen here with startling regularity, so perhaps we'll obtain some professional success here as well. Shalom, chaverim! It's been a hectic week here on Aliyah Street in Nahariya, and I have to say I'm glad to see the end of it--if only because today is the start of Shabbat, and that means REST. The week's adventures started last Saturday, when Pini, one of our kittens, decided to sneak himself into a very dangerous situation. We were getting ready to go to the beach, and realized we'd put our beach towels into storage inside a folding bed in the guestroom. Israel has these strange sorts of single beds which partially fold up, similar to a lounge chair. Underneath, they also have storage areas, which are accessed by lifting up the mattress, either from the head of the bed or from the foot of it. This makes it easy to use the piece of furniture as a kind of daybed or recliner, but it's also easy to convert it into a proper sleeping bed when visitors come. And believe me, Israelis love to have plenty of visitors. The more the merrier, in fact. Anyway, Pini did not announce the fact that he decided to snoop in the storage area where Elul had found the towels, so when Elul dropped the mattress back into place...bam! He heard Pini scream and lifted the mattress back up right away, but the damage was done. Pini seemed to go into a kind of shock, and was very lethargic and out of it for most of the day. Although he could walk and there were no cuts or obviously broken bones, we began to worry that perhaps he'd received some kind of internal injury. Thus began the search for a vet who would see an animal not only on an emergency basis, but on an emergency-on-Shabbat basis. No easy feat! We started by calling two of our dear friends, a couple who live in a kibbutz down the road and who also just happen to have five cats of their own. Fortunately, the lady of the couple was a native Israeli who was kind enough to do the tedious legwork of calling around to different vets until she could find one who would agree to see Pini. Thankfully, she finally found a wonderful veterinarian in Shavei Tzion, a little place on the sea between Nahariya and Acco. We took a cab to the vet's, who examined Pini thoroughly and concluded that he'd most likely been hit in the chest by the bed, and probably had some bruised, but not broken, ribs. He put Pini on an IV-drip, gave him some pain medicine, and offered to keep him there overnight for observation--for free! The final bill ended up only being 468 NIS, or about $125 USD. For that kind of care back in Boca Raton...oy! It would have been a lot more. Eye-wateringly lots more, in fact. This vet was really a great guy. When he examined Pini, he said "you know, if I just wanted to make money off you, I'd recommend that he be x-rayed immediately. But honestly, I don't think he needs it right now. Also, if you want to leave him here overnight, you can do so without charge. It'll be easier for you and easier for him. Just come pick him up tomorrow evening. If he's not better tomorrow morning, I'll call you and suggest that he have an x-ray, but if you don't hear from me, assume everything's fine." And it was. After fainting from sticker shock over the price of a round-trip taxi ride between Nahariya and Shavei Tzion (60 NIS, or about $17 USD), we decided to ride our bicycles to return to the vet's office the next day. And since my bike was the only one with a rack on the back, I got to do the honors of riding Pini home in his grand plastic chariot. Incidentally, despite my loud and unhelpfully skeptical remarks, Elul did an extremely good job of strapping the cat-carrier to the back of the bike with a ball of twine--the twine I usually use for the purposes of tying up roasting chickens. After some initial complaining, Pini adjusted well to this new way of moving around in the world, and even stuck out a paw to greet some friends we met along the promenade. Pini made a rapid recovery, and by the next day he was back to his usual Hulk Hogan-esque "rasslin'" with Dudu. However, fast-forward to yesterday, when we woke up to find Pini once again in poor form, this time limping from some unknown cause. He took it easy all day, trying in vain to get Dudu to leave him in peace, but eventually seemed to feel better and walked normally again. Now he's just avoiding playing with Dudu too enthusiastically. They say cats have nine lives, and Pini seems to be spending his like a drunken feline sailor. By the way, if you enjoy using Facebook for stupid timewasting purposes (as I do), and if you'd like to become Facebook friends with Pini, Dudu, or both, send a friend request to "Pini Gitlin" or "Dudu Gitlin," and watch the cyber fur fly between them. Who knew how much sibling rivalry went on between cats until Facebook arrived? Let me tell you, Dudu talks a lot of smack! Finally, in a "life meets art meets life" kind of moment, here's a picture of Pini and Dudu watching themselves in their own video as smaller kittens. * It seems to be their favorite show, those little egotists! Shalom, chaverim! 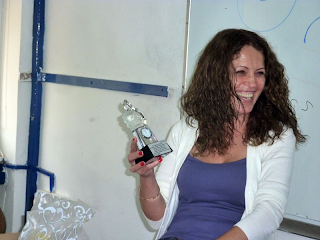 Our last month of Ulpan has begun, and the clock is ticking more and more loudly. Next week we have the first part of our final exam, which is an oral examination administered by one of the Ulpan staff. Personally, I would prefer the type of oral examination given by a dentist, rather than sit in the hot seat trying to speak Hebrew intelligibly. Part of the oral exam is the requirement that we tell the examiner a personal story of some sort. Nothing racy, of course--just a short speech about a hobby, or one's family, or some challenge faced in life. I was tempted to tell a fascinating story about a stubborn case of athlete's foot I defeated with the scientific application of affirmations and positive thinking, but I changed my mind. Instead, I will tell the story of how I was, at the tender age of nineteen, hauled off a bus on the Yugoslavian border by Bulgarian soldiers and shaken down for fifty Deutshmarks for a bogus "transit visa." Fortunately, we have been given plenty of time to prepare for this section and I will be able to find out the Hebrew word for Yugoslavia, the country which no longer exists, as well as the word for "bogus." Earlier this week, I was assiduously avoiding working on my spoken presentation by wasting time watching English (not even Hebrew) television. There was a knock at the door. A woman and a younger man, each with clipboards, very politely and thoroughly identified themselves. I let them go on for awhile. As I nodded and smiled, I was tried to understand anything they were saying so I could figure out what they wanted. Police? No. People taking a survey? Not quite. Government? Well, not quite that either, but I was getting warmer. Eventually I realized they were television license inspectors, and that they wanted to see how many televisions we had. I let them in and showed them "our" two televisions, which actually belong to our landlords. We didn't have a license for them, and I don't know if our landlords have licenses for them, either. After I had struggled along for awhile in my bad Hebrew, the young man finally asked me if I was Russian. I explained that I was an American, and immediately he switched to impeccable English. Doh! It turns out that in Israel, you have to pay an annual license fee for every television you own. Apparently no license had been paid for the apartment we now live in, so they made a personal visit to inform us of the situation. I wasn't that surprised, really, as I was familiar with the same system they have in England and Ireland, where I lived for some time. The visit would not have been particularly noteworthy, really, if it weren't for a couple of funny things that happened. When we explained that we were renters and that the landlord owned the television sets, the man asked me to write that information down in Hebrew on their form and sign it. I said something to the effect of "you'll get this done a lot quicker if you write this information down yourself, and I'll just sign it." He did write it all down, and then asked us to read it to make sure we understood it. Well, I don't read Hebrew very quickly, much less with any degree of comprehension in a situation like this. Elul was having a hard time reading this man's handwriting, and told him so. The man replied, "I see. I'll just put down that you didn't understand what I wrote, and that you refused to sign it because you didn't understand what you were signing. And that's perfectly okay!" What was even funnier was how the visit ended. The lady of the pair asked me how long we'd been here. I replied that we were "olim chadashim" (new immigrants) and had been here about five months. She didn't speak any English, but I can interpret rolled eyes and a sigh of frustration in any language. Apparently, as new olim we are not even required to pay the license fee for the first year we are here. She gave us two official-looking pieces of paper that somewhat resembled bills, one for each television. I asked them what we needed to do with them, and the fellow responded "Nothing. You can throw them away if you want. Goodbye." Now that's the kind of official government visit I like! Shalom, chaverim! It's been a not-too-busy week here in Nahariya, since we had the luxury of having two days off from Ulpan because of last week's holiday, Shavuot. I am still trying to sweat off all the cheesecake I downed during the festivities, which shouldn't be too difficult, since it's getting hotter and hotter by the day. On the other hand, the screw is still turning relentlessly, as we are entering our last month of Hebrew studies. The exam is scheduled for June 28th, and this olah is starting to fret. But Hebrew is different. 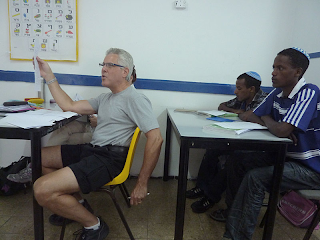 There is absolutely no way anyone can cram for an Ulpan exam. It covers so much material that if you haven't really "gotten" it by now, you're not going to "get it" the night before, either. "Don't panic!" says our teacher Yael. "No depression!" I do a poor job of hiding my rolling eyes and snorts of skepticism when she says things like this. At this stage of the game, everyone in the class can make a fairly educated guess about how the others are likely to do. At this stage, I'd put myself somewhere around the bottom of the middle, and I'd put Elul well in the top tier. "Do the best you can," people say, "and don't worry about it." But I have become uncomfortably self-aware that these days, doing my best just doesn't always cut it. My capacity to get by on little sleep, all the while studying, working, and socializing, like I did in college, has severely diminished with age. My attention span is shorter, and I am resisting and resenting doing homework, just like a truculent child. I'm grouchy if I don't get enough sleep, and I go nuts if the apartment isn't reasonably clean, if there's not enough food in the refrigerator, or if the laundry isn't done. In college I used to live on pizza, beer, Ramen noodles, and coffee, and loved every second of it. I didn't used to be such an old fart! Kvetching about Hebrew aside, life is still sweet in Nahariya. We were recently honored by being asked to become the "buddy family" for an olah chadasha (a woman making Aliyah), who will arrive later this summer. Being a buddy family is a responsibility given to families who have made Aliyah in the past, and the job is to welcome a new person or family who has just made Aliyah. Nefesh B'Nefesh handles this as part of the assimilation process for new olim, and it is an excellent feature of the Aliyah program. Our own buddy family has done a marvelous job of welcoming us, helping us out, and giving us very good advice. We've been to their home many times, and have felt truly connected to Israeli life in a way we might have never experienced otherwise. This week I had the delightful experience of talking to this dear lady, with whom we've been "buddified." We have so much in common it's eerie. She lived in Seattle for decades. I was born in Seattle and spent most of my childhood visiting family there every year. We both spent time in the Southwest: she now lives in Texas, and Elul and I lived in Nevada. We have a keen mutual interest in Middle Eastern dance. We're both adventurous (or is that crazy?) enough to make Aliyah in middle age. And most importantly, we both felt immediately at home in Israel, and felt that insatiable longing to be here the moment we left. But there we differ, in terms of how long we suffered from Israeli homesickness. It was only a couple of years for me, but for her, it was more than forty years! The fact that she's also funny, smart and very nice makes it even better. I am so excited for her, and it feels great to be thrilled about someone else's good fortune.